Disclaimer: I received an opportunity to try out/review Sweat Tracker’s Injury Recovery and Prevention training package as part of being a BibRave Pro. Learn more about becoming a BibRave Pro (ambassador), and check out BibRave.com to review find and write race reviews! About two weeks ago (already?) I completed the Dumbo Double Dare Challenge in Disneyland – a race comprised of a 10K on Saturday, followed by a half marathon on Sunday. Although I had completed similar challenges before (Dumbo in 2013, and the Goofy Challenge – 13.1 & 26.2 – earlier this year – check out all my runDisney recaps here), I thought a little extra help in staying injury free while training pregnant would be “just what the doctor ordered” over the summer so I was happy to check out the Sweat Tracker virtual service. The format of this online training was very straightforward. I received a 12-week training plan, written out with my workouts clearly defined, along with pace suggestions and cross training recommendations. 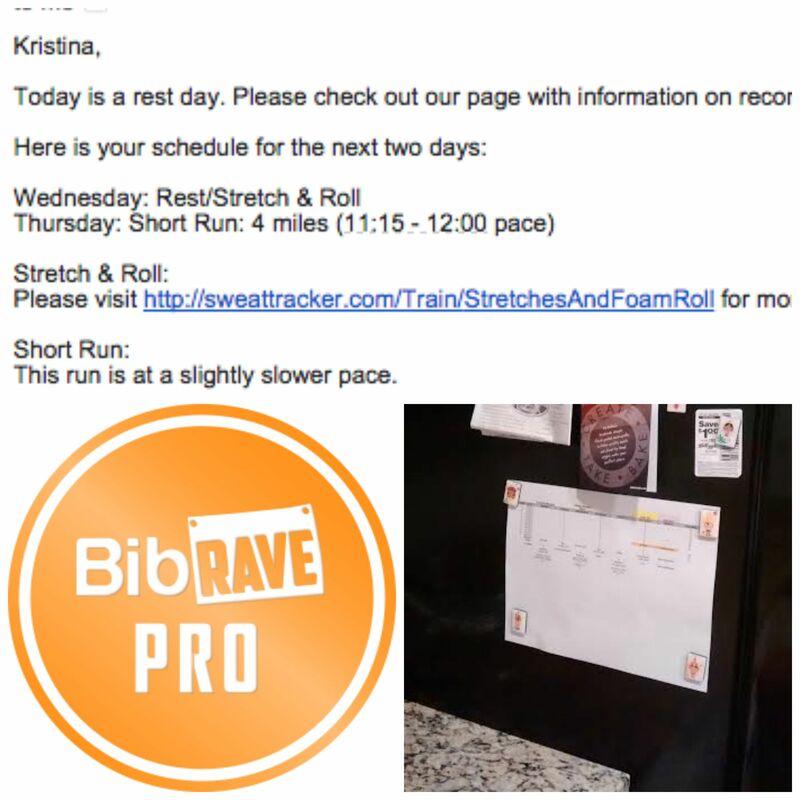 In addition to the formal, laid out plan (which I printed out, and attached to the side of my refrigerator), I received daily emails from my Coach (Coach Jon) and was instructed to send him my feedback on the workouts, as far as actual pace and distance, along with any other worthwhile feedback. I thought the idea of daily emails was actually really neat, and at the start of the program, I was diligent about getting these replies to Coach Jon…but the key there was “at the start.” I noticed that my long runs were written for Saturdays and I liked Sundays better, and asked if I could swap them for the remainder of the training plan (which Coach Jon said was fine) but he didn’t adjust in the emails. Not a huge deal, since I could notate this on my own, but I thought it would have been nice to have the email cadence adjusted. Despite these roadblocks, I still felt that I was on track for my goals because when I did get out to run, the runs were solid. I was running slightly faster than the prescribed paces, but very close to the ranges. As a running coach myself, it was easy to see where I could tweak things…which, ultimately, was probably a negative because I should have been taking more advantage of my coaching resource. Race day came and went, and I feel they went really well. My initial goal was to run the 10K on race day easy (nailed it) and the 13.1 in 2:30 (I hit a 2:39:20, but with character stops and a restroom break) so although it wasn’t right on, I did get there without injury, so I considered it a win! Daily Emails – in addition to feeling that extra push in the morning, seeing a personalized message was a nice touch that kept me thinking about my workouts and runs. Cross Training Recommendations – so many plans I have used before suggest you cross train, but then they don’t tell you WHAT you should be doing – or how much of it! As a coach myself, I know I am guilty of this sometimes. Sweat Tracker is different – not only do they prescribe specific workouts (including details regarding repetitions and sets), they send links to video demonstrations on how to perform specific exercises and stretches. Great value adder! Online Motivation – if you are a Social Media person, you’ll like Sweat Tracker! I got tweets, favorites, and even a personalized “tile” on instagram with my race results! It was cool knowing they were in my corner. Quick and Kind Feedback – Beyond my personal coach (Jon), I had check-ins from Coach Larry, who seemed to be in charge of more of the accounting/administrative details with the plan. He always responded in an expedient manner and was very courteous in email exchanges. 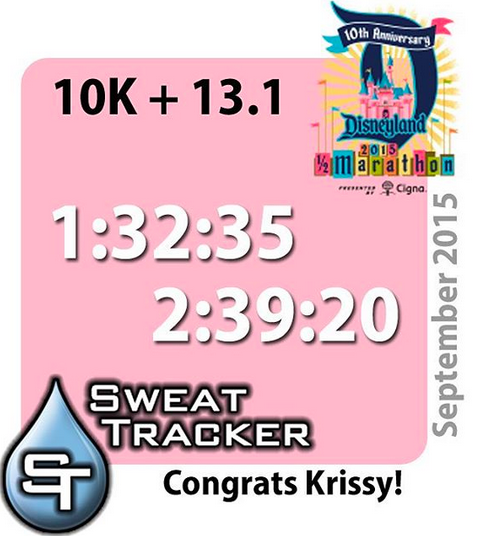 Surprises – I received a cool shirt from Sweat Tracker after I completed my race. That was a nice touch! No option (that I was aware of) of other ways to communicate – I am an email/text person, so I did appreciate that I could email or text my Coach when I needed to, so that worked out – but as a coach myself, I know that sometimes a client wants more (phone, skype, facetime, etc.) So, although this wasn’t a negative for me, it could be for a person that needs more motivation. As you can see, the PROS outweigh the cons, and in all, I have been satisfied with my Sweat Tracker experience. With a week left to go in the plan, I am winding down and looking to see what workouts I can incorporate as I move forward in pregnancy, since I don’t have any other immediate race goals for the rest of the year. I am glad I had the opportunity to test this service out, and with the recommendations I suggested, I would wholeheartedly recommend Sweat Tracker to other runners looking for well-rounded plans with an extra dose of accountability. Have you ever used an online coaching service?